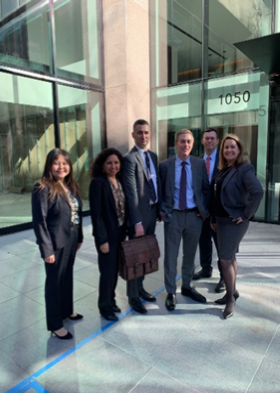 Members of the Insolvency Law Committee (ILC) and the BLS Executive Committee were invited to attend the Conference of Chief Bankruptcy Judges and Bankruptcy Lawyer Representatives of the Ninth Circuit in Portland, Oregon on March 17 and 18, 2019. ILC members Maggie Bordeaux, Misty Perry Isaacson, and Cathy Ta, BLS Vice Chair Corey Weber and BLS Executive Committee advisor Tom Phinney all attended the conference as Lawyer Representatives to the Ninth Circuit Judicial Conference. They were also involved in planning the conference and speaking on the educational panels. Misty Perry Isaacson organized the education portion of the conference and led the panel discussion with the director of the Office of the U.S. Trustee, and Corey Weber spoke on a panel regarding bankruptcy fraud and forfeiture law.